← Blogging and the “Wow” factor. . . Courtesy of Associated Press. 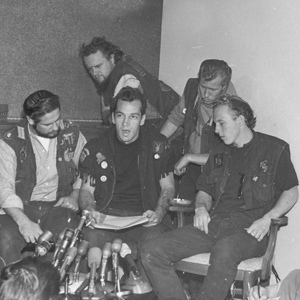 Ralph “Sonny” Barger (center), president of the Oakland chapter of the Hells Angels, reads a statement during a news conference in Oakland, Calif., on Nov. 19, 1965. When is a party a party? And when is a party just a get together? That was the question I asked myself as I read the headline staring out at me: “Hells Angels to Celebrate Oakland Chapter’s 50th Anniversary.” The Bay Area is the birthplace of the Hells Angels most infamous chapter: the Oakland Hells Angels; the focal point in the most notorious outlaw motorcycle club in the land. . . the baddest of the bad. The “81” as the Angels are known in the parlance of the biker world, will be out in full force, this weekend, reminiscent of their coming out party in Hollister many years ago. . . The image that the Angels conjures up is one of violence and trouble. When I told my girlfriend about my plans to feature the Hells Angels in this post her only comment (in her sweetest voice) illustrates my point: “Oh. . . ah well I guess you can write about whatever you want honey.” There in lies the rub when considering the Hells Angel’s controversial history–there is more to this group than meets the eye. To understand the Angels, you must first understand the man behind the organization: the Baddest of the Bad Sonny Barger. Barger founded the Hell’s Angels most influential chapter,the Oakland chapter, 50 years ago as an expression of freedom. The Angels became a sanctuary for the disenchanted and the disenfranchised; it became a place for those men who did not wish to be a slave to society’s expectations or norms. The original charter, San Bernardino, was established by returning WWII veterans who not only felt this disconnection from society but also a burning desire for adventure. Following the original mold while improving upon it, Barger modeled the Oakland chapter after a military unit with a general (Barger), officers, and street level soldiers. Throughout his tenure as club president, Barger committed himself to living free and riding often. This commitment became a way of life and a call to arms. Anybody who has not been living on Pluto for the past half century understands the criminal background the Hell’s Angels have represented. Yet the major media has painted the “81” as the ultimate villains, bad guys and a virtual poster boy for crime in modern society. On the other hand, the major media has fostered a long standing love affair with the Mafia. The movie industry has a long history of glorification of mobsters (Italian in most cases) as does their counterparts in the print and television medias. The best example of this glorification is the most popular television cereal of all time: The Sopranos. Why the disparity in perception? Why are fictional or real characters like Michael Corleone, John Gotti, or Tony Soprano romanticized? And why was a figure like Sonny Barger ostracized and targeted as the bad guy in our social structure? My theory is simple: the Immigrant & Social Order factor. In my opinion the reason we, as Americans, love to love the mobsters real or fictional is because they represent society. These were men who rose from the impoverished. These men were rumored to hold respect and honor as the highest of ethics–a sort of honor among criminals. We could identify with them as was the case with my Italian uncle and his love for the Corleone figure in the Godfather movies. They had a social order in our society albeit an underworld order. These men like Gotti or Soprano were family men, with wifes and children and mortgages. They lived within the social structure. . . while ripping us off blind! In complete contrast, Sonny Barger and the Hell’s Angels were separatists. They wanted nothing to do with society so they created their own social order. They rejected what society deemed a normal family life, normal values, and normal social behaviors. They were satisfied with complete disconnection from society. Granted many Angels have wifes and kids but they do not use them as “fronts” like the traditional mafia. Therefore I believe that the Hell’s Angels are a far more honest and forthright group than any mafia organization has ever been in our long history of organized crime. With the “81” what you see is what you get. You know where they stand and they do not hide behind family or perception. They are what they are. . . with the traditional mafia you have an organization much tougher to see, more difficult to understand, and much harder to hate. . .
Consequently this weekend marks the passing of the 50th Anniversary of the Oakland Hell’s Angels with a party beyond parties. Make no mistake this one is going to be a big time party, expected to draw up to 2,000 Angels from around the world. All are destined to land at the original Oakland chapter clubhouse: 4019 Foothill Blvd Oakland, California. For those citizens crazy enough to even entertain the idea of taking a peek or drive by I have one simple suggestion: Don’t EVEN think about it! I do not need a guilty conscious if something were to befall my brethren in the blogging world. Peace to all. . .
Dean – are you going to drop in and take a few pics of the festivities and maybe an April Fool’s post on the gang? I found that picture online at an aol site. It’s not mine but I figured if it was on the net it deserved to be seen since it is a very cool shot.I liked how the guys looked as if they were ready to ride. I am a SF native too. Enjoy the picture and thanks for the read-be well! I just finished Hunter Thompson’s book on the Angels. I know Sonny Barger regards the book as junk and Thompson (one of my favorite authors ) as foul, so I thought I’d look for different points of view. Thanks for yours. Thanks for the kind words! Hunter S. Thompson, true to his rogue writer’s lifestyle a true modern day Hemmingway on chemicals, dared to ride with the Angels. That alone was a gutty move. I have not read the book just excerpts. Suffice it to say, Sonny Barger and the Angels are very compelling in their lifestyle, convictions, and codes. And Satan is scared shittles of you. Drop A gear and disapear. I have not direct connections to the Angels just admire their balls! As far as Deacon that name is familiar from reading and rumors around the Bay Area. I can’t answer your question. Maybe try a Google search of their names or go to the Oakland Chapter website and ask directly? Good luck! leave your email…. Boomer is great and I just saw Deakon, et. al. a week ago for Boomers 40 years in The Club anniversary celebration. I will (respectfully) ask you a few questions only a ‘friendly’ would know (about Boomer) before I pass on any message to him regarding an old friend from Ringling Bros. looking to say Hello. thats a picture of the legend himself, the late, great bob roberts. May I ask when Bob Roberts died and where is the picture you mention? I have a JPG pic of Bob Roberts and Jimmy Souza but am unable to post it here. I think its the same b&w pic spoken of here. Are there other pics available. Mr Roberts also appears in the movie Gimme Shelter about Altamont Stones concert. Hes seen putting a serious stare on Mick Jagger. Angel Eyes, Your dad Bob Roberts showed more class at Altamont than anyone. I just read about him in John Clarks book Dead Angel. He had nothing but good to say about him. I am in touch with Bobs son Girims best friend Mike M.He has ultimate respect for your dad as do I. You have so much to be proud of. Bob Roberts, the REAL American Legend. I’m Jimmy Souza’s brother, Tony (check this with his kids), I have the pic of Bob and Jimmy you mentioned and will send it to anyone interested. Very sorry to hear about your Dad. I knew him in the mid 60’s and respected him. I was 18 and on my way to Vietnam. The picture that I placed in this article no longer exists. Unfortunately I found the pic on the internet and the file must have been removed. Consequently what was a fantastic shot of a few Angels, what looked like outside a bar, hangin out is gone. I have no answer as to when Mr. Roberts passed or when the picture was taken down off the internet. Are there any other pictures of Gog Roberts? Bob roberts passed away in the summer of 2006. The picture was of Bob and the legend Jimmy Souza. You are truly one of the few who rode with Sonny and the Angels! I love your candid honest comment here. Do you have any other stories? If you would like to tell them–let me know. Thank you for adding what is obviously a piece of history to this article–I love it! Can you re- post the picture of Bob Roberts and Jimmy Souza? The picture of Bob Roberts and Jimmy Souza I found online through a Google Search in March of 2007. Since that time it lived within this article up to about a year ago. The pic was really cool with the guys hangin outside a bar looking just like Hells Angels should look. Unfortunately the picture was removed by either WordPress the owner of this platform or it was somehow removed by the source I found it from originally. I wish I could pass it along! Jimmy ‘the Cat’… rippin’ up the asphalt on that blue knuck! More than a legend- a truly unique individual, taken way too soon. have always thought that Bob Roberts (via Gimme Shelter) was Pete Knell although I certainly didn’t think Bob looked much like Pete! I wasn’t aware of Bob’s name until quite recently. I have always admired him in the movie (as well as Bill “Sweet William” Fritsch, the Angel who talks with Paul Kantner onstage). looking forward to reading John Clark’s book, “Dead Angel”. Incidentally, I wrote a novel about a fictional motorcycle club in SF during the 1960’s & 70’s and one of my main characters is named John Clark!! Very strange! Bob Roberts is as history will attest the real deal in the !%er biker world. He put Sonny i n his place more than once. He has since passed away and sadly he has been overlooked in defference to Sonny. Watch Gimme Shelter, watch Bob on stage looking at Jagger with bewildered disdain. He was then the SF chapter pres. of the HA. He had it all under control and watch as he handles that tripped out freak with confidence as well as care. He didnt toss him off the stage as is often reported. He carefully lowered him down with no brutality at all. Thts what make him the Real Deal. Thank you Trotter for your relating your story about Bob Roberts! Hi Trotter! I did read John Clark’s book “Dead Angel” a while back & Bob Roberts was definitely the real deal! Great to gain some insight/information about him! I have also learned much more about Sweet William over the past few months (of which I am not at liberty to discuss), but he’s still hanging in there! Thank you for adding your perspective. I sometimes wonder where many of the original 81’s are and how they have fared. Thanks again! You’re welcome! I, too, always wonder about those original (SF especially) members. Glad to have been able to provide a bit more info re: Bill Fritsch.